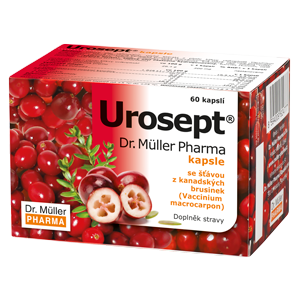 Urosept® product line offers a number of preparations with juice of Vaccinium macrocarpon also called large cranberry. 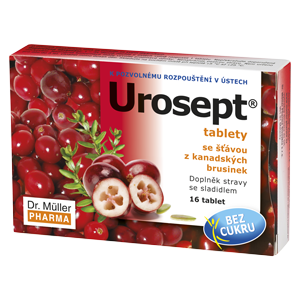 Urosept® capsules contain concentrated juice of large cranberry (Vaccinium macrocarpon). Swallow 1-2 capsules daily and follow with a sufficient amount of a drink. 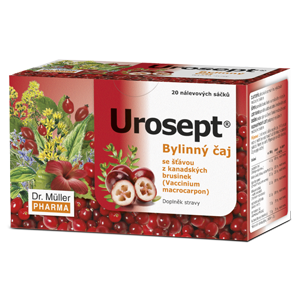 Herbal tea with juice of Vaccinium macrocarpon (large cranberry)..
3 cups daily are recommended for adults while 1-2 cups daily for children aged 3-12. Composition: Bulking agent (sorbitol), dry extract of Vaccinium macrocarpon fruit, glidant (talc, magnesium stearate, colloidal silicon dioxide). Let dissolve 1 tablet in the mouth 1-3 times daily. Do not exceed the recommended doses. The product does not substitute varied diet. The product is not intended for children. Excessive use can have laxative effect. Keep out of the sight and reach of children. 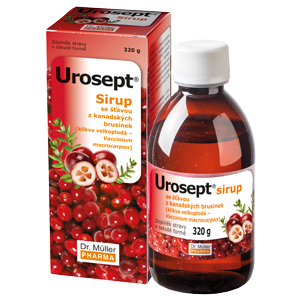 Urosept® syrup contains concentrated juice of large cranberries (Vaccinium macrocarpon). Due to its excellent taste, it is convenient for children aged 3 and up. 1-3 tea spoons (5-15 ml) daily. The syrup can also be added to tea or any other warm or cold drink, or as syrup dissolved in water. The maximum recommended doses (15 ml of syrup) corresponds to 38,300 mg of fresh cranberry fruits.